Back in late 2011 I started building what is known as a UK High Yield Portfolio (HYP). It was a much talked about strategy back in the Motley Fool forum days and is still being discussed on the more recent Lemon Fool forums. One of the aims of a HYP was as a substitute for an annuity in retirement. This meant that the dividends spun off by the HYP needed to increase at a rate which is equal to or greater than inflation if it was to be called a successful investment strategy. I unitised my HYP a long time ago so I know in 2017 that goal was easily achieved with dividends increasing by 20.1% which is well above the current inflation rate (RPI) of 3.9%. The dividend increase was largely helped by the only ad-hoc event to occur in 2017 which was National Grid’s (NG.) special dividend and share consolidation. If I net that special dividend off as many would argue that was really a return of capital it’s still done its job with a 6.7% dividend increase. Along the lines of replacing an annuity its original aim was to help me live off dividends only in FIRE and in that regard it’s still punching above its weight. In 2017 it spun off £3,929 in dividends. When we come to register in our new Med country as self sufficient, unlike the UK and one of the reasons we ended up with the disaster that is Brexit IMHO, we’re going to need to demonstrate sufficient income and/or capital to prove we’re not a potential burden on the state. Those dividends are a good chunk of income to help with that. Sainsbury’s, Astra Zeneca and SSSE were all bought on the same day back in late 2011. The big divergence in values nicely demonstrates why I no longer actively trade or invest. I’m rubbish at it... The annualised capital gains/losses of my complete HYP shown in the chart below further demonstrate this. 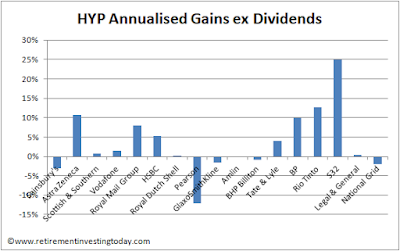 While ever the HYP comes close to matching the total return (dividends + capital gains) of a simple FTSE tracker over the long term I’m happy to stay with it. If it can’t I’d be better off selling up, buying an ETF tracker, accepting I’ll need to sell down capital to eat and then going fishing. Dividends. The trailing dividend yield of the HYP for 2017 was 5.8%. In contrast the FTSE100 was 3.8% and the FTSE250 is 2.6%. The FTSE100 most closely resembles the type of companies held within the HYP. So far so good. Capital Gains. Over 2017 the HYP has seen a capital gain of only 4.0%. In contrast the FTSE100 gained 7.6% and the FTSE250 gained 14.7%. This looks like a bit of a disaster but if I play the longer game since HYP inception my gains are 49.7% compared with the FTSE100’s 44.7% and the FTSE250’s far more healthy 109.2%. Total Return. For 2017 my HYP total return is therefore 9.8% while the FTSE100 has total returns of 11.4% and the FTSE250 17.3%. 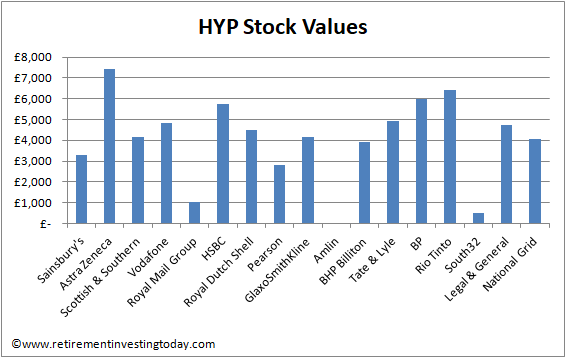 A poor year for my HYP with it under performing its 2 main competitive indices on a total return basis. 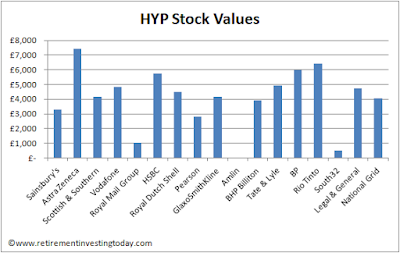 Looking longer term and knowing that every year since inception the HYP has paid more dividends than the tracked indices it’s still outperforming the FTSE100 but under performing the FTSE250. The 2018 plan is to sit on my hands and just continue to collect the dividends. "low expense, physical (as opposed to synthetic) ... ETFs tracking enough indices ..."
I'd like to invest/speculate in agricultural commodities. Presumably the relevant ETFs are all synthetic? I don't imagine that any ETF owns silos full of grain, do they? When I first started investing I bought a diversified ETC which 'held' precious metals, oil, grains, livestock etc. It was also a x2 fund as I thought I was going to be clever and ride the commodities bull. It was a big learning as it turned out what I was buying was "a 'leveraged' exposure to a total return investment in commodities futures contracts". Not quite what I thought I was buying. I held the ETC for 16 months during which time it more than halved in value. This was partly because I wasn't buying physical but was buying futures meaning contango and backwardation came into play. The x2 leverage was also a problem as valuations were based on the "daily percentage change". I made an enquiry about this to another international financial advisor company and the costs were 3% to set it up and around 1.8% a year to manage it so it was very expensive. I was wondering if you or anybody else had found a cheaper way of setting up a legal tax efficiency way of investing and drawdown for expats in Spain? Yes I have looked at this and unless you're a 'Bargain Loving Brit in the Sun' it's going to sting. My understanding is that the first EUR6,000 of my investments will be taxed at 19% which then rises to 21% up to EUR50,000. I believe there is a personal allowance of EUR5,550 which takes some of the sting out but I don't have definitive answer that it's applicable to investments. Another thing not to forget is that Spain still has their Wealth Tax. Do read up on that. My understanding is that your first EUR700k per person is tax free plus Spanish residents get a further EUR300k of home relief. There are also reliefs for some pensions I believe. 'Spain bonds' are also the best wheeze I've heard of to reduce tax but what you save in tax you seem to lose in expenses. They certainly don't have ISA's etc. - 5% on everything above it. If it still exists when I get there it would be a perfect way to extract everything from my pension to stop the rules changing and minimise risk of exceeding the LTA during the second check I would see in drawdown which is at 75. Hi and thanks for the feedback. Tax mitigation is an issue but we have already committed to Spain as we both speak Spanish and have lived in Spanish speaking countries for over 20 years so very familiar with the culture and way of life. We didnt want to choose a country purely on financial reasons and then find out we don't like it. We love the Spanish culture and way of life. I 100% agree that tax should not wag the where to live dog. That said it is a couple of lines in our Pugh matrix as less tax leaves more discretionary spending/lower draw down depletion risk in the event of a poor sequence of returns. Understand what you mean when you say Spanish culture/way of life and we have never lived anywhere Spanish speaking. Would be genuinely interested in what you find. Some other readers are also in similar boats so could be very useful for them as well. I also don't expect we'll fully retire. Over the years I've been pretty consistent with my early retirement definition being 'work becomes optional'. Good luck to you as well bc1050. I envy your Spanish speaking head start. Useful article in as much as it shows the juice isn't worth the squeeze for the HYP. KISS and all that? > the juice isn't worth the squeeze for the HYP. KISS and all that? perhaps you wouldn't start from there but I have a HYP which has similar things to RIT, though I started builting the HYP between 2009 and 2011. The less volatile/steady income is comforting as you get closer to the point where you start thinking "I might need to live off this". That has a certain value in itself, retirement is an emotional as well as an intellectual journey.